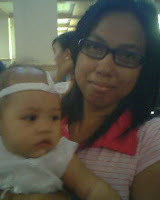 that's me and baby rayyah.. my beautiful inaanak.. this was taken during her christening.. i just wanted to greet her a Happy Happy birthday. she is celebrating her 1st bday today. i'll be there at your house in a jiffy.. (need to finish some important stuff here at the office first)wish you all the happiness ahead you my baby gurl. may god bless you always and be rest assured we will always be here for you no matter what. luvu baby! i'll see you later ok? mwah!!!!!!!! !